The Nobel Prize won by Francis Crick in 1962 for his discovery of DNA was sold Thursday at auction for more than $2 million. Heritage Auctions identified the buyer as Jack Wang, CEO of Biomobie, a regenerative medicine technology company located in Silicon Valley and Shanghai. The price surpassed the pre-sale estimate of $500,000. On Wednesday, a letter Crick wrote to his son describing the discovery sold at Christie's for $6 million. 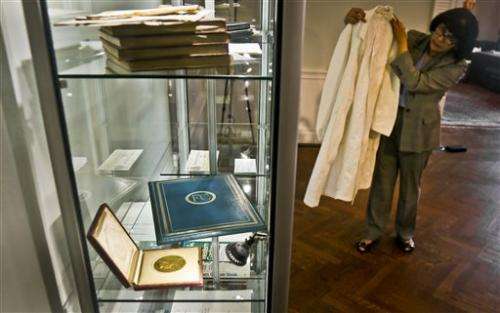 It was a record for a letter, eclipsing a record price for an Abraham Lincoln letter that went for $3.4 million in 2008. Crick was awarded the Nobel Prize in physiology or medicine along with James Watson and Maurice Wilkins. He spent the latter decades of his career doing brain research at the Salk Institute for Biological Studies in La Jolla, Calif. He died in 2004 at age 88. The medal was among 11 artifacts Crick's heirs offered at the Heritage auction. Wang said the medal and diploma will be used to encourage Biomobie scientists working on regenerating damaged human organs. He said the company's work could "launch a biomedical revolution like the discovery of the structure of DNA." 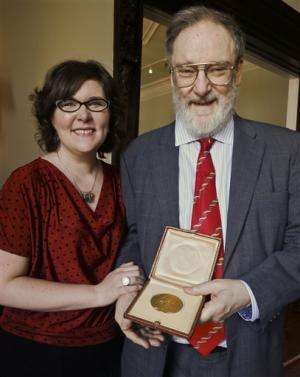 Crick's granddaughter Kindra said the family decided to sell the medal and other items because they had been in storage for 50 years, first locked up in a room of her grandfather's La Jolla, Calif., home and later in a safe deposit box. They chose to sell them now because it "coincides with the 60th anniversary of the historic discovery and 50 years since he received the award," she said. Twenty percent of the proceeds from the Heritage Auctions sale will go to the new Francis Crick Institute in London, a medical research institute slated to open in 2015. Half the proceeds from the Christie's sale will benefit the Salk Institute, the granddaughter said. Crick's son Michael, who was in New York to attend the auctions with his daughter, told The Associated Press that the family hoped the winning bids went to someone who "will give people the opportunity to look at them and that they will be an inspiration for future scientists." The 1962 medal is struck in 23-karat gold. One side features the Genius of Medicine holding an open book in her lap, collecting water pouring out of a rock to quench the thirst of a sick girl beside her. It was offered together with his Nobel diploma, a handsome two-page vellum document that contains an original picture of a long-haired youth in a blue tunic holding the Rod of Asclepius. 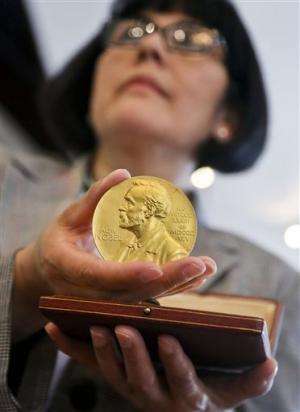 Dallas-based Heritage Auctions said it is only the second time that a Nobel medal has been offered at a public auction. The first was Aage Niels Bohr's 1975 Nobel in Physics that sold in November for about $50,000, said Sandra Palomino, director of its historical manuscripts. The late William Faulkner's 1950 Nobel Prize for Literature is heading for auction at Sotheby's in June. Other items in the Heritage sale include Crick's endorsed Nobel Prize check in the amount of 85,739,88 Swedish krona, dated Dec. 10, 1962, and a white lab coat complete with stains and wear. Michael Crick said he has made "really good copies" of the letter that was sold Wednesday at Christie's. In the March 19, 1953, handwritten letter to his then-12-year-old son, Francis Crick describes his discovery of the structure of DNA as something "beautiful." The note tells his son how he and James Watson found the copying mechanism "by which life comes from life." It includes a simple sketch of DNA's double helix structure, which Crick concedes he can't draw very well. The seven-page letter, written to his son in boarding school, concludes: "Read this carefully so that you will understand it. When you come home we will show you the model. Lots of love, Daddy."